of the pale morning gold. who consorts with two worlds. “I have the strangest dreams. and the beating of moth’s wings. She remembered all the dreams now. shifting jewels in some unseen hand. 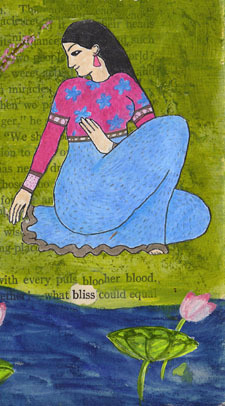 One of my favorite altered book techniques is to use the text from a hard cover book as the base for developing poetry and related imagery. When I choose a book to alter, I am most often guided by the title of the book. I pull the book off the shelf and look more closely at a few things. I look to see if the binding is stitched securely and if the pages are heavy enough to stand up to some gluing, painting, stitching or whatever else I might try to do to them. This particular book, Dreams and Delights met these requirements, and as an added bonus, had wonderful chapter titles which I knew would inspire me. When I’m ready to start, I scan the first few pages of the book, looking for words and phrases that speak to me of a poem waiting to be found. I discovered these words of gold on page 9: “. . . swam away on another wave of dream. . .” This phrase appeared on the ninth line of text, so I looked above it for a pronoun to start the poem. There was the word “she” on the very first line. Perfect. From there, I look at each line of text, trying to find ways to connect words and phrases to create my found poem. I search for imagery and word combinations that I like. I write the poem down on paper as I go along, referencing the paragraph and line numbers so that I can find the phrases again later. Creating found poetry this way is an exciting process for me. Of course, I am relying on the original author’s ability to use descriptive language in his or her writing. A lot of the prose written in the earlier part of the 20th century was very flowery and overdone, compared to much of what is written today. These works are wonderful for found poetry because I can pare down the dense text and create something new, spare, and sometimes beautiful. But just as playing with the text on the page can yield exciting results, it can be the source of frustration as well. Many times I’ve gotten into the rhythm of a poem that seemed to be turning out nicely, only to come to a dead end with no text left on the page to create a satisfying conclusion. Sometimes I can wriggle my way out of it; other times I have to turn the page to make a new start. 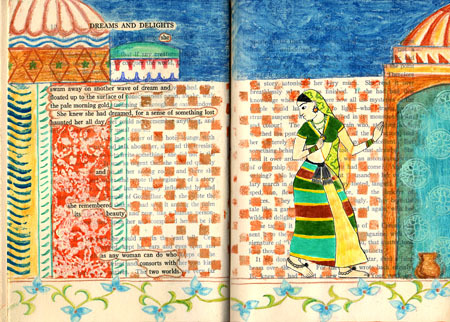 That’s the beauty and the challenge of creating poetry in an altered book. 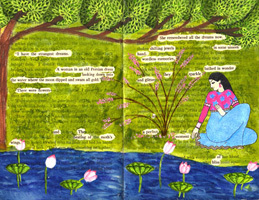 When I’m happy with the poem, my next step is to mask the text out so that I can create artwork around the poem without obliterating it; this is one of my favorite altered book techniques. I use liquid Masquepen for this. It’s a little bottle of blue liquid that feels like rubber cement when it dries. It’s rather expensive, but a little bit goes a long way. Once the masque has dried, I create the art for the page. Since Dreams and Delights is a collection of stories that are thematically tied to Persia and the Orient, I decided to imitate the artwork found in Persian miniatures. I have several books that I referred to, looking at the patterns, the clothing, and the colors found in those ancient jewels of art. I used several altered book techniques on these two double page spreads. The background art work was done right on the book pages. I painted with acrylics, inks, and watercolor crayons and pencils, stamped with acrylic paints and inks, and drew with colored pencils to create the background scenery. Even though I’m using a lot of water media, I try to be very careful not to get the page too wet because I want to avoid wrinkling the pages. I drew the pictures of the women separately on heavy matte finished paper. Drawing people is one of those areas that I don’t feel very confident, so I wanted to make sure that I could get the women drawn and painted just right without messing up the rest of the page. 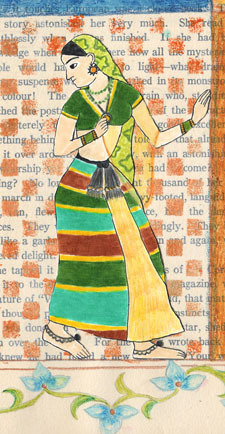 I used colored pencils and fine tipped markers to draw the pictures of the women. Then cut and glued them into the book. After all the art work was done, I used my finger and a pair of tweezers to carefully remove the masquepen. I push and peel it off the page to reveal the words underneath. I then spray the pages with a matte finish to protect them. Although I have only completed two pages in my book so far, I have written two more found poems within it that are just waiting to be illustrated. Hopefully I’ll find time to come back to this book soon and use these same altered book techniques. If you’re interested in seeing more examples of these altered book techniques, take a look at another altered book of mine called A Cup of Sky which also incorporates found poetry and water media.